Nobody thinks a whole lot about the price tags at retail stores. Well, that is until you come across one that is priced incorrectly or is missing all together. On the flip side, it gets to be a lot when you are the store sales associate who has to keep up with changing prices. It's a never ending battle. At least once every week, when there is a promotion, they have to switch out the sales prices with the regular ones, and then price the new sales items for the next promotion. It's a time consuming process that usually ends up being quite imperfect. French company, SES-imagotag, has an easy and unique solution for exactly these situations, with a lot of other nice perks built right in. And this concept, which seems so simplistic that it really doesn't need any discussion about it, is actually quite interesting in that it has so many practical uses for both the retailer and the consumer. For starters, retailers will have a central command center where they can set and make all pricing and product adjustments automatically. For smaller retail shops, this command center would be right there in their back offices. For larger retailers, it could even be located at a nationwide headquarters. Similar to large chains who currently, say, have all of the same music playing in each store, that is controlled remotely. They would also be able to ensure that their pricing integrity is always on point. No more mistakes at the individual contributor employee level for missing a sales price or not removing one after the sales is over, creating embarrassment and pricing exceptions if a shopper finds it first. But accurate pricing is not the only feature of these sleek little gizmos. Maybe even more importantly, they can each be customized to fit with store and product strategies. Not only can SKU numbers and product names be added, but also logos, QR Codes and NFC Chips can be included. This gives the shopper a huge advantage while deciding upon a product. Imagine being able to instantly connect to the product's internet home page right on your smart phone to get additional information and compare prices. It gives more power for smart buying decisions without needing to search for a sales person who may or may not have all of that information that you need. 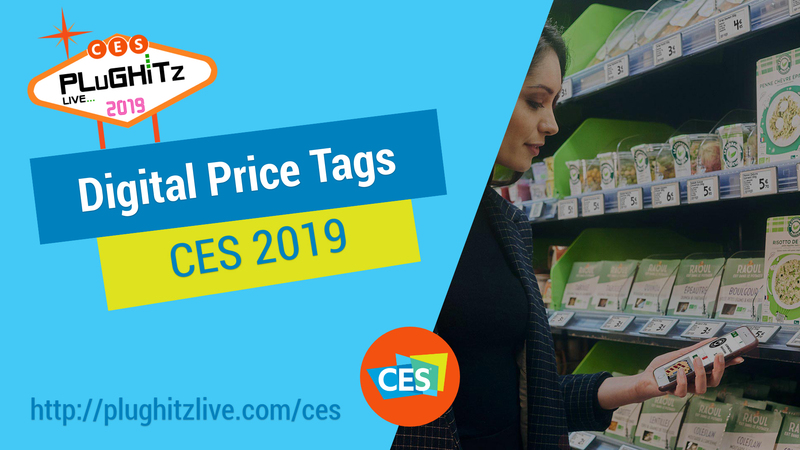 While this type of electronic product tagging system is beginning to hit the ground in France, the model that we encountered at CES 2019 is still in the prototype stage. It is getting closer to being brought to market and they hope to introduce it in U.S. markets in the near future. For more information, please visit their website.